Robert Indiana, one of the most pre-eminent figures in American art since the 1960s, has played a central role in the development of assemblage art, hard-edge painting and Pop Art. 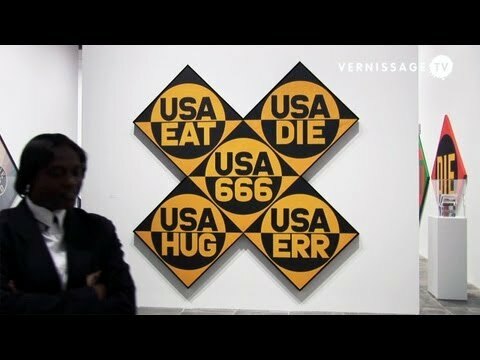 A self-proclaimed “American Painter of Signs,” Indiana has created a highly original body of work that explores American identity, personal history and the power of abstraction and language, establishing an important legacy that resonates in the work of many contemporary artists who make the written word a central element of their oeuvre. Robert Indiana was born Robert Clark in New Castle, Indiana on September 13, 1928. Adopted as an infant, he spent his childhood moving frequently throughout his namesake state. His artistic talent was evident at an early age, and its recognition by a first grade teacher encouraged his decision to become an artist. In 1942, Indiana moved to Indianapolis in order to attend Arsenal Technical High School, known for its strong arts curriculum. After graduating he spent three years in the U.S. Air Force and then studied at the Art Institute of Chicago, the Skowhegan School of Sculpture and Painting in Maine, and the Edinburgh College of Art in Scotland. In 1956, two years after moving to New York, Indiana met Ellsworth Kelly, and upon his recommendation took up residence in Coenties Slip - once a major port on the southeast tip of Manhattan. There he joined a community of artists that would come to include Kelly, Agnes Martin, James Rosenquist and Jack Youngerman. The environment of the Slip had a profound impact on Indiana’s work, and his early paintings include a series of hard-edge double gingko leaves inspired by the trees which grew in nearby Jeannette Park. He also incorporated the gingko form into his 19-foot mural Stavrosis (1958), a crucifixion pieced together from forty-four sheets of paper that he found in his loft. It was upon completion of this work that Indiana adopted the name of his native state as his own. Indiana, like some of his fellow artists, scavenged the area’s abandoned warehouses for materials, creating sculptural assemblages from old wooden beams, rusted metal wheels and other remnants of the shipping trade that had thrived in Coenties Slip. While he created hanging works such as Jeanne d’Arc (1960) and Wall of China (1960), the majority were freestanding constructions which Indiana called “herms” after the sculptures that served as boundary markers at crossroads in ancient Greece and Rome. The discovery of 19th century brass stencils led to the incorporation of brightly colored numbers and short emotionally charged words onto these sculptures as well as canvases, and became the basis of his new painterly vocabulary. Indiana quickly gained repute as one of the most creative artists of his generation, and was featured in influential New York shows such as New Forms - New Media at the Martha Jackson Gallery (1960), Art of Assemblage at the Museum of Modern Art (1961), and The New Realists at the Sidney Janis Gallery (1962). In 1961, the Museum of Modern Art acquired The American Dream, I (1961), the first in a series of paintings exploring the illusory American Dream, establishing Indiana as one of the most significant members of the new generation of Pop artists who were eclipsing the prominent painters of the New York School. Although acknowledged as a leader of Pop, Indiana distinguished himself from his Pop peers by addressing important social and political issues and incorporating profound historical and literary references into his works. American literary references appear in paintings such as The Calumet (1961) and Melville (1961), exhibited in 1962 in Indiana’s first New York solo exhibition, held at Eleanor Ward’s Stable Gallery. In 1964, Indiana accepted Philip Johnson’s invitation to design new work for the New York State Pavilion at the New York World’s Fair, creating a 20-foot EAT sign composed of flashing lights, and collaborated with Andy Warhol on the film 'Eat', a silent portrait of Indiana eating a mushroom in his Coenties Slip studio. His first European solo exhibition took place in 1966 at Galerie Schmela in Düsseldorf, Germany, and featured his Numbers (1965), a series of paintings on a theme that he has explored in various formats throughout his career. 1966 marked a turning point in Indiana’s career with the success of his LOVE image, which had been featured in a solo exhibition at the Stable Gallery. The word 'Love', a theme central to Indiana’s work, first appeared in the painting Four Star Love (1961). Love is a subject of great spiritual significance for the artist, illustrated by the painting Love Is God (1964), which was inspired by an inscription in the Christian Science churches he attended in his youth. Initially experimenting with a composition of stacked letters in a series of 1964 rubbings, Indiana subsequently turned this inventive design, a formal departure from his previous works, into different hard-edged color variations on canvas. Indiana’s LOVE, selected by the Museum of Modern Art in 1965 for their Christmas card, quickly permeated wider popular culture, and was adopted as an emblem of the “Love Generation.” Appearing on a best-selling United States Postal Service stamp (1973) and reproduced on countless unauthorized products, the proliferation of the image led, on one hand, to negative criticism and incorrect assumptions of the artist as a sell-out. However, the image’s popularity more importantly emphasizes its great resonance with large and diverse audiences and has become an icon of modern art. The universality of the subject, to which Indiana continues to return, is further evidenced by his translation of LOVE into AHAVA (Hebrew) and AMOR (Spanish). In 1978, Indiana chose to remove himself from the New York art world. He settled on the remote island of Vinalhaven in Maine, moving into the Star of Hope, a Victorian building that had previously served as an Odd Fellows Lodge. After a period spent setting up his home and new studio, Indiana turned to themes that related to his local experience, working on a suite of eighteen large-scale paintings known as The Hartley Elegies (1989-94), inspired by the German Officer paintings of Marsden Hartley, who lived on Vinalhaven in the summer of 1938. He also used found objects to create sculptures such as Ash (1985) and Mars (1990), works that reflected his new surroundings while also making reference to his past, and returned to and expanded upon his seminal American Dream series, completing The Ninth American Dream in 2001. In addition to being a painter and sculptor, Indiana has created a significant number of prints, among them the Numbers Portfolio (1968), a collaboration with the poet Robert Creeley, as well as many other works of graphic art, including the poster for the opening of the New York State Theater, Lincoln Center (1964), and the poster for the opening exhibition of the Hirshhorn Museum of Art (1974). 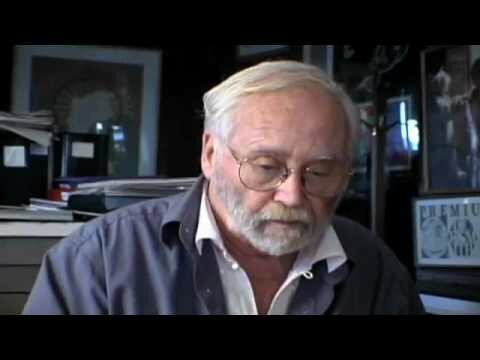 He designed the stage sets and costumes for the Virgil Thompson and Gertrude Stein opera The Mother of Us All, which was presented in 1967 at the Walker Art Center in Minneapolis and expanded in 1976 for the Santa Fe Opera in honor of the Bicentennial. Indiana has also created other unique projects, such as the design for a basketball court at the Milwaukee Exposition Convention Center Arena in 1977. Indiana’s artwork has been featured in numerous solo and group exhibitions around the world, and his works are in the permanent collections of important museums such as the Museum of Modern Art and the Whitney Museum of American Art in New York, the National Gallery of Art, the Hirshhorn Museum and Sculpture Garden and the Smithsonian Museum of American Art in Washington, D.C., the Ablright-Knox Art Gallery in Buffalo, New York, the San Francisco Museum of Modern Art, the Menil Collection in Houston, Texas, the Currier Museum of Art, Manchester, New Hampshire, the Museum Ludwig in Cologne, Germany, the Stedelijk van Abbemuseum in Eindhoven, Netherlands, the Museum Ludwig in Vienna, Austria, the Shanghai Art Museum in China, and the Israel Museum in Jerusalem. He has also been included in numerous international publications, and is the subject of a number of monographs. Robert Indiana, elusive Pop-Art legend, offers a private view into the events, people and places that have shaped his art. Filmed on location at Indiana's island home, the film, narrated by Indiana in an exclusive interview, details the pictorial memoir he has assembled about his long life, from his origins in the state he made his namesake to his role in the creation of the Pop- Art movement in downtown New York through his involvement in the Museum of Modern Art, his eventual disillusionment with the New York art scene, and the great resurgence of interest in his work both in Europe and the United States, as he takes stock of his life and legacy.